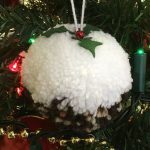 This week we interviewed Beth, Tunbridge Wells store, who explains ‘Stitchscaping’ and how she came across this beautiful craft. 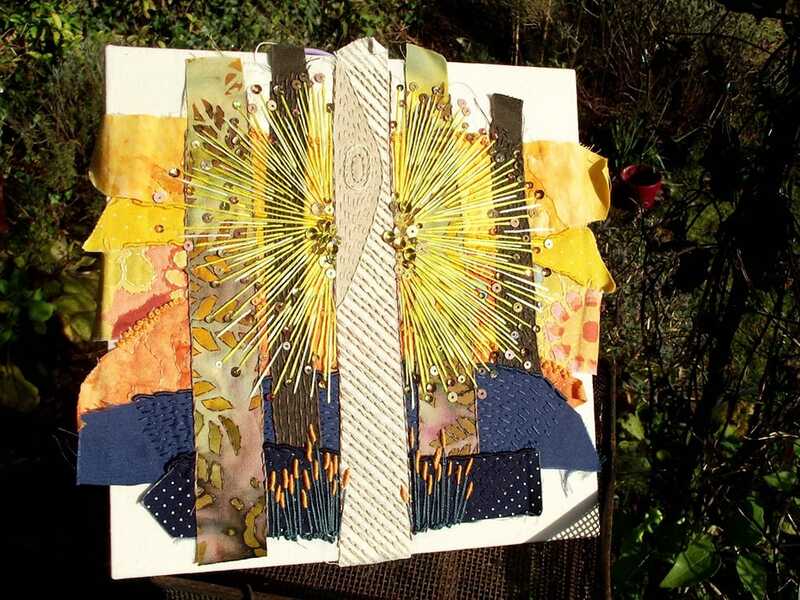 The act of capturing a moment, a view or an idea in a fabric photograph; suggesting parts of that image with colour, fabric and embroidery and creating an overall ‘scape’ through stitch. I’ve always loved sewing and playing with fabrics (I’m a terrible hoarder of materials- the attic is groaning with boxes!) 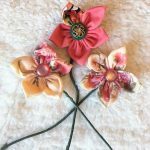 and when that passion took me to De Montfort University to do a degree in Mixed Media Textiles, it was like living a dream getting to play all day long! When finishing university however I went swiftly into working the day job and my sewing became more of a hobby and got pushed to one side. The stitchscapes literally developed out of one evening when I was tired and feeling a little melancholic and the itch to stitch drew me to my stash. The craving for getting everything out and playing with colour, texture and pattern was quite overwhelming, and with nothing in mind I cut and stitched, laying printed cottons down onto a base cloth, working on autopilot for the enjoyment only. 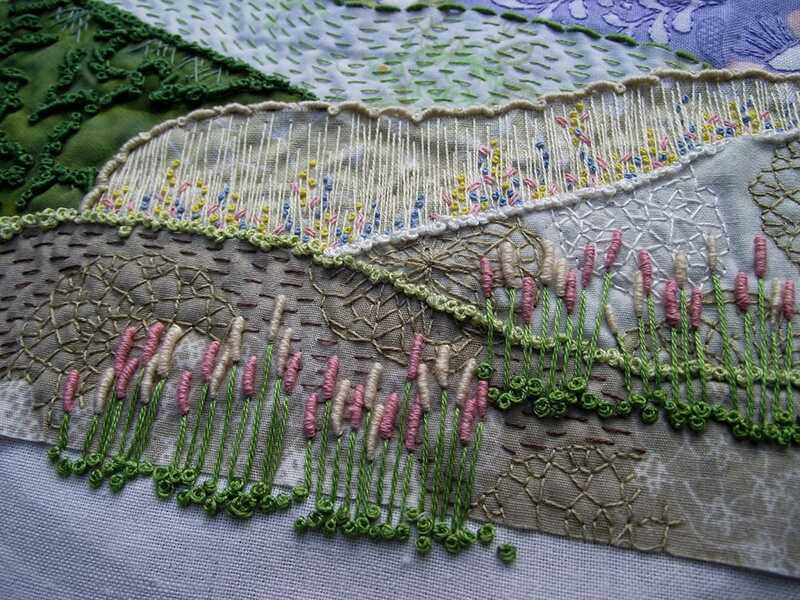 The initial stitches were just following the patterns of the fabrics whilst I rediscovered my favourite ones; French knots, bullion knots, seed stitch, whip stitch, the good old back stitch. The forms that were being created started to remind me of fields and flowers so I carried on working in that vein until I was happy with the finished composition. 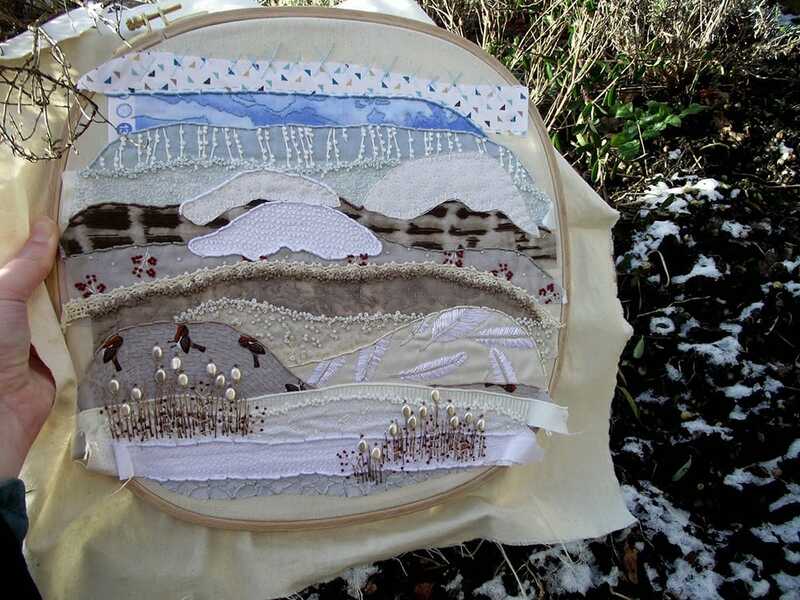 The free-flow way of working really inspired me and suddenly I had all of these ideas for further stitchscapes jostling inside my head, desperate to be let out into the hoop. 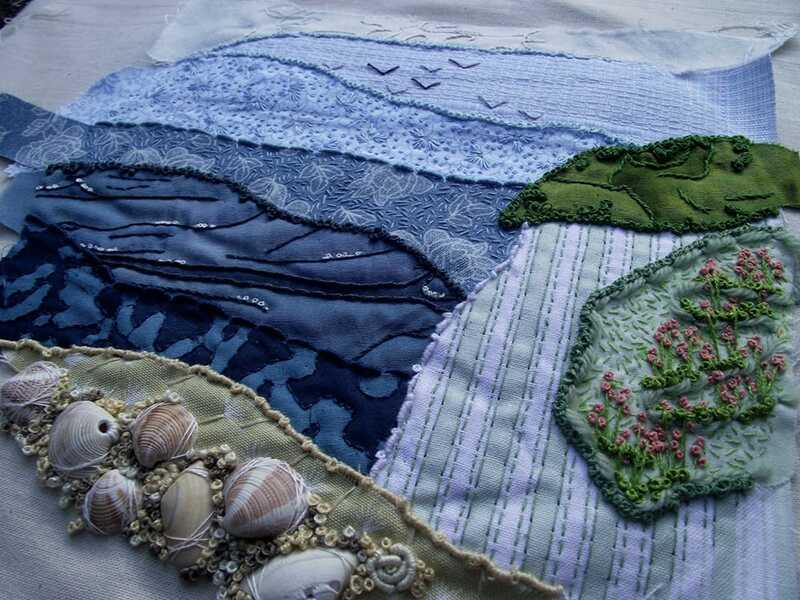 From then on, one stitchscape inspired another and the pieces got larger, more intricate, some lead by a single stitch I wanted to explore further or some by a fabric I wanted to use again. 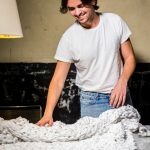 Throughout all of my pieces I have tried to keep this initial, instinctive, almost mad way of working going, and often have absolutely no idea what the finished piece will look like other than a vague idea of something I might be trying to achieve. I don’t keep sketchbooks any more but I am constantly taking photographs and some of these may be the initial spark of an idea, although usually it is something I’ve seen that makes a mental impression. My commutes for work are especially inspirational as, on the bus, I go through dense woodland, drop down through rolling fields and chug up steep hills whilst the sun flames over the trees or the frost sugar-coats everything in a sprinkle of glitter- all of these get locked away in a mental memory bank and whirl around until they reappear in my hoop. What processes do you use? 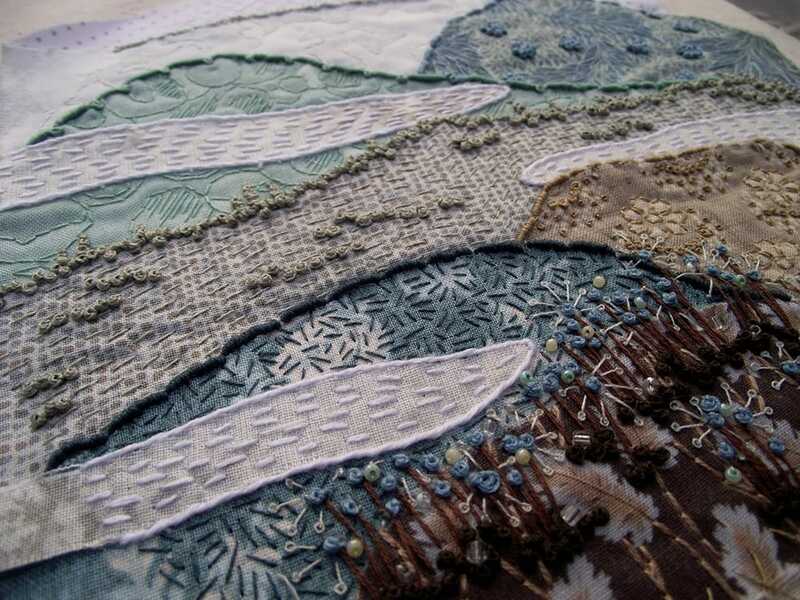 When starting a new stitchscape, I will often have a basic outline ready, by which I mean I will know if it has trees in it, or mountains, perhaps a sunset, or, like more recently, a giant supermoon. I like to use a medium weight, good quality calico for the base cloth as it is stable and forgiving, and to this I will lay out fabric suggestions, playing with the order of pattern and colour until I’m ready to cut the shapes. These are roughly cut and briefly tacked down to hold them in place so that the fun can begin! 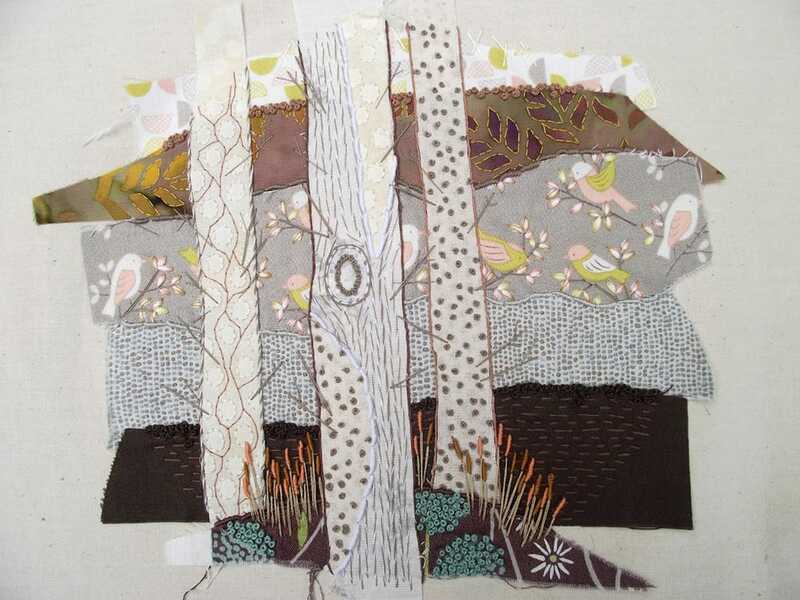 My initial approach of using the printed patterns to inform stitch choice still applies and I tend to systematically work the layers from either the top or the bottom, ‘filling in’ fabrics as I go. Flowers, finer details, extra layers come later and I’m not afraid to completely unpick an entire section if I don’t think it has worked (the price to pay for not planning in advance!). I am trying to become more experimental with what I am working with, but so far my fabric choices are very simple. 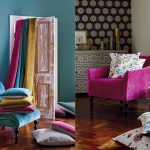 I collect remnants and fat quarters of 100% cotton fabric and have a vast range of colours and patterns; small prints and batik or space dyed prints are brilliant for backgrounds. I am not averse to using other types of materials but this isn’t an avenue I have really delved so much into yet. For the actual embroidery part I favour DMC stranded embroidery threads as the colours are so beautiful. I have also recently discovered DMC Mouline Satin and Metallic threads which have the most incredible lustre and finish to them; walking past a DMC thread stand for me is like being a little kid with their nose pressed against a sweet shop window- so much to choose from! 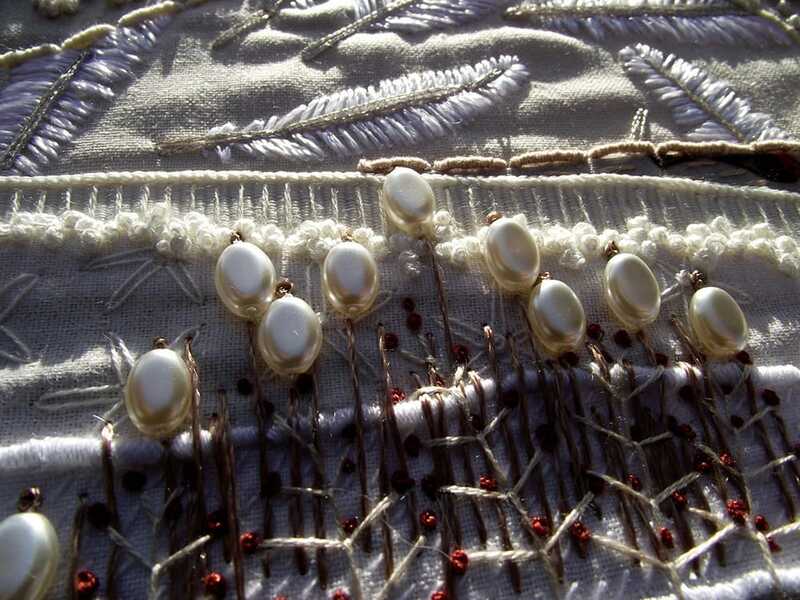 Often I will use beads, heavier yarns which are couched down, lace, ribbons and even shells to add interest or texture. There is no real right or wrong and I’m happy to experiment and be playful with my work. 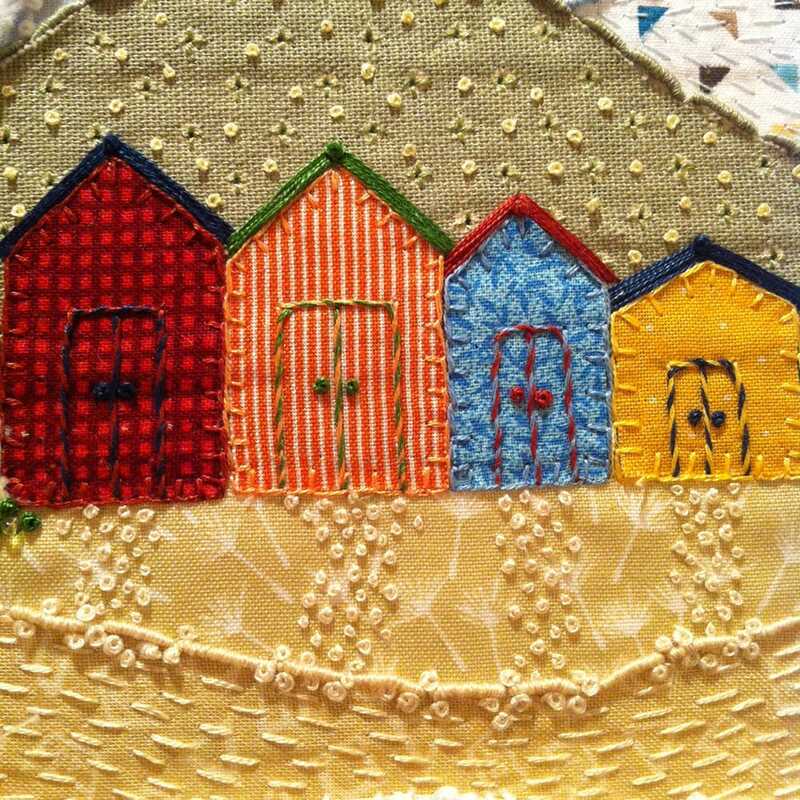 I think this is a hard one to answer as most stitchscapes have a special memory or attachment to a place. 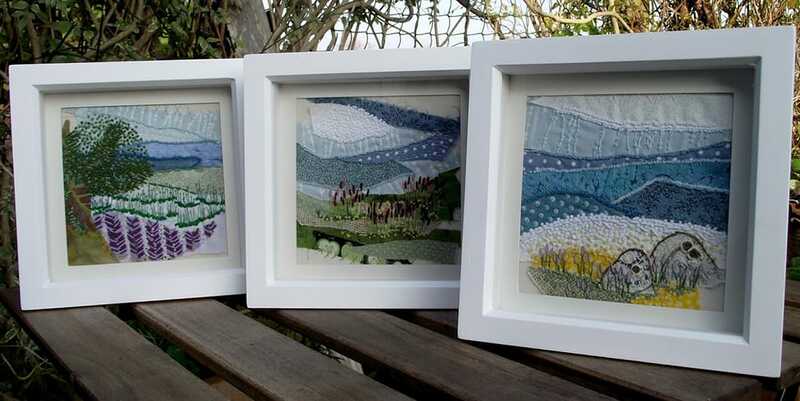 My White Cliffs stitchscape holds a lot of happy memories of a family holiday to Yorkshire, and includes shells collected from the beaches we visited, and my Sunburst Stitchscape was inspired by a photograph I took on my birthday a couple of years ago when I picnicked with friends and family on the nearby Ashdown Forest and stayed until the sun set through a group of trees known as ‘Friends Clump’. I don’t think I have created my absolute favourite one yet so I shall just have to keep trying until I do. 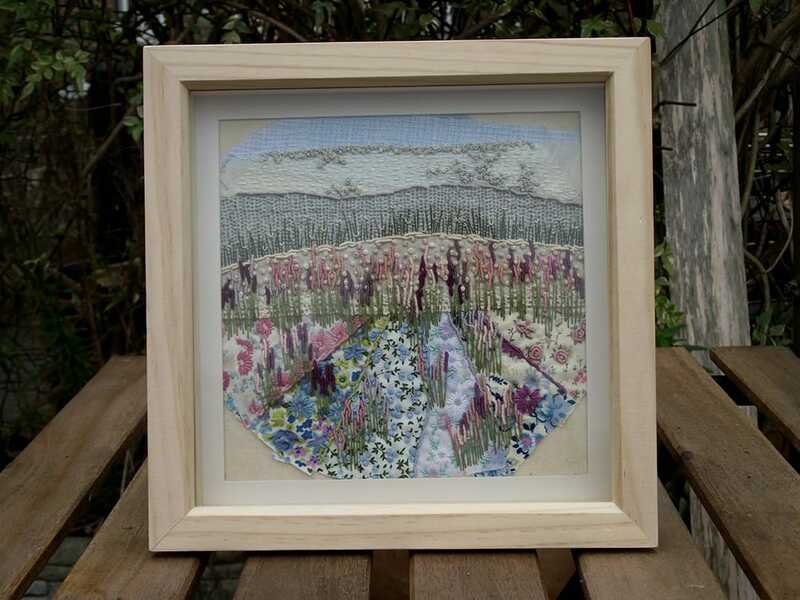 Thank you to Beth for taking the time to answer our questions and to see more of her stunning stitchscapes, visit her blog. Very nice work. It must be lovely to be so creative and to be able to express it. Love your work Beth … You have amazing talent ! © 2018 Closs & Hamblin. All Rights Reserved.